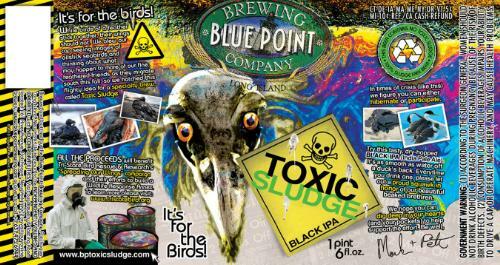 Long Island, NY – As American’s attention spans for the Deep Water Horizon oil spill begin to wane, Blue Point Brewing Company today announced a batch of charity brew created specifically to help birds hurt by oil spills, both now and in the future. The Black IPA (India Pale Ale) called Toxic Sludge will be available for distribution in draft and 22 oz bottles just in time for fall migration. To help jumpstart fundraising efforts, starting today “Save the Buffleheads” T-shirts will be sold online for $25 at www.bptoxicsludge.com. The smallest diving duck in North America, the Bufflehead breeds in Canada and winters off the Gulf Coast. Tri-State Bird Rescue & Research is an internationally recognized, licensed, nonprofit wildlife rehabilitation organization that cares for nearly 3,000 injured, orphaned, and oiled native wild birds each year ranging from hummingbirds to eagles. Tri-State is currently leading the wildlife rehabilitation response to the oil spill in the Gulf of Mexico.